Mr. Callahan was born and raised in Phoenix, Arizona where he attended Christian schools from K-12th grade. 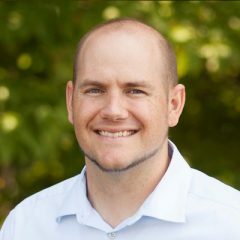 After high school, Mr. Callahan played college soccer at Scottsdale Community College and then moved to Pennsylvania to complete his bachelor’s degree in history at Geneva College. At Geneva, Mr. Callahan met his lovely wife Julia. Following his undergraduate work at Geneva, Mr. Callahan moved back to Phoenix and attended Arizona State University for his Masters in Secondary Education. Mr. Callahan has taught social studies to students from 7th -12th grade during his teaching career and was the head of the social studies department at Phoenix Christian Preparatory School, teaching advanced placement courses including AP American history and AP US government. During his time at Phoenix Christian, Mr. Callahan was the varsity high school soccer coach as well as student council advisor. While at Phoenix Christian, Mr. Callahan begin pursuing his second master’s degree in educational administration. In 2015, Mr. Callahan excepted the position of Head of School Administrator at Payson Christian School (K-12) in Arizona, where he served for three years and was successful at leading the school to initial accreditation through ACSI. In 2016, Mr. Callahan completed his second master’s degree from Grand Canyon University in educational administration. Mr. Callahan and his wife Julia I have two daughters – Ailee and Dottie. Mr. Callahan and his family felt called by the Lord to join GCA because it was the perfect fit for them. GCA matched his passion is for working with teenagers and seeing young people grow into Godly adults. Mr. Callahan was very impressed by the academic rigor and spiritual maturity of Grace Covenant Academy. The school truly balances and provides academic excellence as well as spiritual equipping for the students. The staff are all excellent instructors and love the students with the heart of Christ. As a father, Mr. Callahan is so excited to send his girls to GCA. He can’t wait to see the Lord grow GCA and build a middle school all to the glory of Christ. We encourage parents and prospective students to visit GCA and see #theGCAway in action! Beyond the classroom, GCA students participate in a variety of enrichment classes including STEM, Performing Arts, and Spanish, to name a few!